Since 2013 we have been the most booked hostel in Pai, a hostel known as the most popular place to meet great people and enjoy a good party. All of our staff are lady boys, please only come if you’re ok with this. Almost every night we have free entertainment for everyone to watch or join in with from, fire show, free Pad Thai dinner, free curry dinner, open mic, pool party, quiz night, pool competition, ect.. Yes we are a party hostel but we try to shut everything down by 12 and we do our best to keep the noise down after midnight so people can sleep. Most of our rooms are so far away from the bar so you can sleep anytime and won't hear great tunes playing but if you do sleep after midnight you can enjoy a room pool/bar side. For breakfast at circus we tried to do something a little different. We have a Chef in the restaurant area ready to cook you fresh eggs of any style, fried, scrambled or omelette. Sausages, toast with jam, marmalade or butter, pan cakes, waffles, eggy bread, chicken fried rice, vegetable fried rice, salad, two types of mixed vegetables (seasonal), selection of fresh fruit (seasonal) and a selection of fresh organic juice and ice tea. This is an all you can eat buffet NOT included in the room price. So is the circus super clean?? NOPE Circus is an outdoor place. We have all huts, dorms and bathrooms in separate buildings on a huge site with an epic infinity pool in the middle and a pool side bar next to it. Being the most popular backpacker hostel we have people around all the time throughout the day walking in and out of the toilets, showers, rooms, playing Frisbee, dancing on the grass ect… this means MUDDY floors everywhere. If in any way you don't like this please DON'T BOOK HERE ,we don't want to see you un happy, obviously it's just mud and things stained but the design of this place makes it impossible for it to not look dirty everywhere. So why the name circus? For ten years before the circus opened the owner(backpacker from England) was a circus performer/extreme sports athlete. Often the place is full of people juggling, playing with fire performing toys ect… this really can change day by day. If you come to stay at the circus you never know before if the place will be full of circus people or pool party type people. If you're willing to explore and try something different and awesome then this is the place for you. 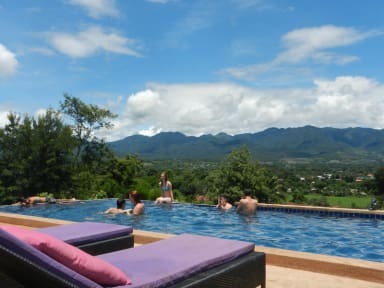 You can view our video here to see the infinity pool, amazing view (best location in Pai) and atmosphere you won't want to miss! Many of our guests have commented that staying at the circus is like staying at an epic mini festival on a hill with amazing backpackers always around to hang out and party with. Sometime we have volunteers teaching free circus lessons and free yoga lessons but this is dependent on if we have a volunteer staying. We have high speed fibre optic WIFI in public areas and we have put basic internet box's into the dorms that it doesn't reach. The reception WIFI is the best internet package we can buy in Thailand and the basic internet for rooms is good for checking emails or Facebook. Often this is not working because of bad weather but we bought the best internet in the city and that's the best we can do. In the reception, we have a large restaurant that seats 60 people, each table has comfortable chairs and a power charging tower so many items can be charged at any one time perfect for digital nomads or just backpackers with a lot of things to charge lol. Next to the pool is the pool side bar and lounging area, there is a free pool table, lazy chairs for 20 people and 4 hammocks. He likes to chill at reception but the moment someone wants to play he is up and ready. We rent new safe motorbikes for you to be able to explore the waterfalls ect.. We do not work with rental companies all our bikes our from the hostel and bought new June 2017 guaranteeing no scams and safe serviced bikes. Twice a week we have a family buffet dinner with over 10 choices of Thai dishes. We have had over 25 professional artists come and contribute around the hostel with street art, if you like street art you will love walking around looking at everything. We take the security of our guests and their belongings as a high priority and have installed full CCTV cameras, 24-hour staff and have lockers in every dorm room. Sometimes people complain of bugs/mosquito in the 12 bed dorm because it only takes one person out of 12 to leave the door open for bugs to come in. If you hate this choose the private room only. - Newly built and opened January 2018!!! -DO NOT take this room if you plan to stay in bed all day the huts get very hot in the day its 40 degree here most days. Our dorms run air con all day. If you plan to arrive more than two hours after your check in time please let us know or your room might be sold. We do not allow children under the age of 16 year old and no pets are allowed to be brought on site. Great hostel, ended up extending my stay multiple days, I debated switching to a cheaper one but the pool and atmosphere made it too hard to leave. Definitely would recommend for solo travelers as it’s super easy to meet people. The free yoga and nice breakfast was great! really fun people staying here, so glad I stayed whilst at Pai! Had a great time here, it’s a great place to hang by the pool drinking beers or maybe a happy shake ☺️ I extended my stay for 4 extra nights because I didn’t want to leave! Stayed in K1. One of the coziest beds I’ve slept in backpacking. Door didn’t lock, felt safe otherwise. Bathroom very clean. Party hostels aren’t my thing but I think what they offer is on point. Really great social hostel. Provides free dinner at 8pm daily and does breakfast buffet for 100baht every morning till 12. Only downside I experienced was one of the receptionist was very rude, everyone else was very nice. Great pool and chill area with lovely views. The breakfast is amazing for 100 baht, you get an all you can eat buffet from 8-12. The beds were fairly comfy but the air con wasn’t brilliant. Plus you had to walk to the main reception to go to the toilet. Another downside was that there was no yoga teacher so that was disappointing and the vibes at night were very chilled. All in all a fairly decent hostel! Stayed here for 3 nights at the being of songkran, unfortunately the hostel emptied out a bit as everyone went to Chiang Mai. Still met some really cool people. Love this hostel, it has some really chill vibes, pool isn’t the cleanest but it was still nice to have one. Location isn’t fab, about a 5-10 min walk into town, but not really a massive issue. As a solo traveller it was ideal, lots of people I met said they’d booked for 2 nights and stayed for 5+. We didn't enjoy our time here, only stayed for two nights. The atmosphere just did not feel right for us, we found it difficult to meet and chat with the other guests, and we are usually very social at other hostels; it felt quite young & cliquey, but then again it could have been the crowd that were there at the time. There also did not seem to be enough toilets for the amount of guests and placed very far away from the rooms. The pool, staff and breakfast were bonuses about this hostel. We weren’t as impressed with this hostel as we thought we would be. We had been recommended to come here and just expected more, it wasn’t that welcoming and felt quite cliquey, which is something we have never felt about another hostel, although that could have just been due to the other guests there at the time. Definitely wasn’t what I expected. I had heard great things, but never lived up the the hype. For a “partyish” hostel they make you be quiet at 12 AM. It was chill and they closed the kitchen at the most random hours. I was pretty displeased with the stay and thought it was pretty average. The photos seemed outdated and nothing like the description.